The Curse Continues ©Charles Berlin 2007 = Yes, that's Loren Coleman in the vehicle. Memories of the collapse of bridges of bygone days - the Silver Bridge (at Rt. 35) at Point Pleasant, WVA and the I-35 W Bridge in Minneapolis - come to mind when a new bridge falls. Popular culture has associated Mothman sightings with such collapses. The falling of tonight's bridge on I-5 out West is not linked to any reports of winged creatures being seen in the area. 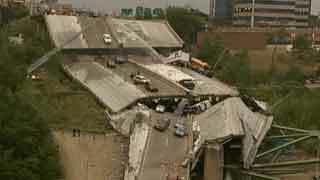 The I-35W Bridge collapse, 2007. The Rt. 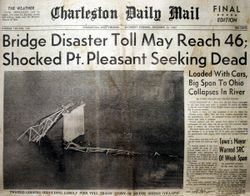 35 Silver Bridge collapse, 1967. Historically, Washington State had some rather significant weird flying men sighting in 1948. In that year, there were two unusual sightings in Washington State (hundreds of miles south of Mt. Vernon, please note). On January 6, 1948, on a farm just outside the small town of Chehalis, 61-year-old Bernice Zaikowski saw a man flying with some sort of wings strapped to his back. Only a few months after Zaikowski’s sighting, on April 9, 1948, three flying men were seen above Longview, Washington state. Viola Johnson, a laundry worker, and the eyewitnesses told reporters she had seen what looked like “three men in flying suits flying through the air. They wore dark drab flying suits...circling the city." 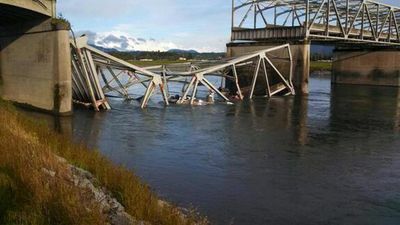 The Interstate 5 bridge over the Skagit River at Mount Vernon, Washington State did collapse Thursday evening, May 23, 2013, dumping vehicles and people into the water shortly after 7 p.m.
One individual was pulled from the water, one was seen on the top of a car, and an unknown number of people were missing in the water. State Patrol Trooper Mark Francis said it was not clear how many were in the water or the extent the injuries. Photos showed one man sitting on the top of his red car waiting to be rescued. Rita Miller, who works at the Riverbend RV Park, said a Navy rescue team was on the site with a helicopter with dozens of first responders. A crowd of about 1,000 people gathered at the bridge. A hovercraft was near the fifth bridge span to the north and was fighting the strong Skagit River current on the west side of the bridge during the rescue effort. It was not clear what caused the collapse. The four-lane north and southbound bridge, built in 1955, was used by 70,000 vehicles daily, according to 2010 statistics. Latest and verified by video footage, a tractor hauling an oversized load hit a bridge support causing the collapse. I live in the area. The bridge is far too small and old for the traffic it's been carrying. It's always scared me and I generally avoided driving over it for that reason. 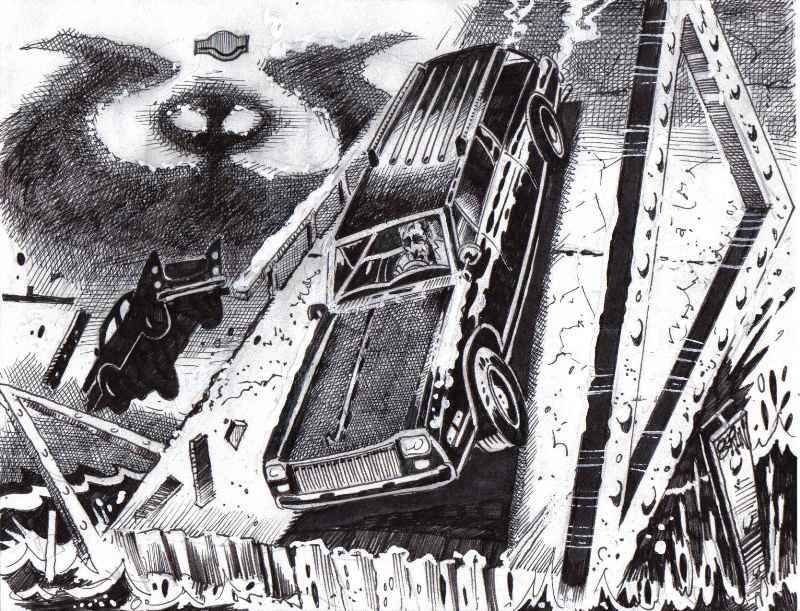 I always expected something awful would happen on the bridge. Thank Got no lives were lost. Nothing paranormal or supernatural was involved. Rather, this is just another instance of how our national priorities are so screwed up we'll spend billions on pointless wars while ignoring our dangerously obsolete and falling down yet critical infrastructure.